Turn any pot into a mash tun. 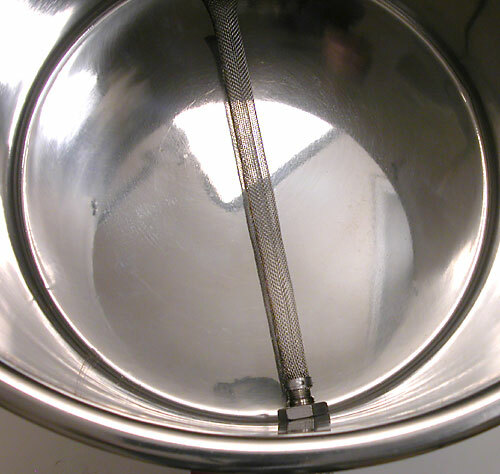 This all stainless straining screen screws into the threaded back inlet of the Polarware Brew Pot and other pots with 1/2" female NPT bulkheads, allowing you to mash or strain out whole hops from the boil (these tend to clog when using a lot of pellet hops). 12" long. from Durham, NC very good! essential! this product is very good and allowed me to get rid of false bottoms, i can brew with just one kettle. it is easy to fit and is very sturdy. I recommend! I added one of these to my system 4 years ago and couldn't imagine life without it. It works really well with whole hops or loose leaf. It has never clogged on me once and does a great job of filtering out pretty much everything. I have heard that it doesn't work to well with pellet hops but i never brew with those anyway. I don't have a false bottom for my kettle but this works perfect. When I first received mine I went to put it in my brew pot and it came apart in my hand. The clamp holding the screen to the fitting is a joke. Replace with a stainless worm (hose) clamp before you even attempt to use. Otherwise very good. I purchesed 2 of these to use as an extra layer of filter underneath the false bottom in Polar Ware pots. Both screens have broked/failed. The first screen broke with notmal use as it "unzipped" and opened up making the screen worthless (this happened on the 3rd or 4th use). The second screen unclamped from the threaded male collar (clamp failed) that screws into the back inlet of the brew pot. I will likely replace the clamp on the second screen. Both screens failed, and I'n not satisfied with the durability. The screens are stainless and easy to clean and worked well, they just didn't last very long before failure. Pros: If you use whole hops, this works really well straining them out after the boil. Especially works well if you use a heat exchange wort cooler.